A crow sounds the alarm. 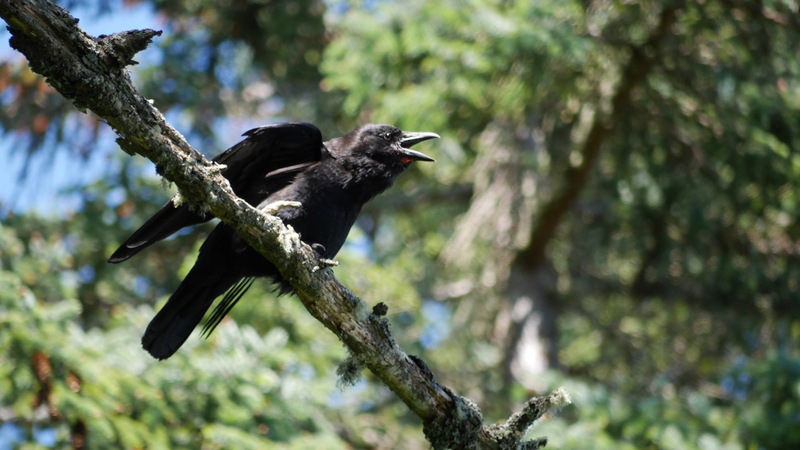 I wake up one morning to a cacophony of agitated crows sounding through my open window. The room is so bright its hard to open my eyes. I prop up on one elbow and squint with one eye at the clock; it reads 5:30AM. I lie back for a moment waiting for the cobwebs to clear from a late night at the computer. There is very little darkness here in Alaska in June. It’s easy to be up 18 hours a day or more. The crows are still squawking, clearly upset. I sit up and glance out my window. I can see several crows taking turns dive bombing something just below my line of vision down in one of the many ravines in the rock. Whatever it is that is setting them off, they are trying to drive it away. I decide to go have a look. 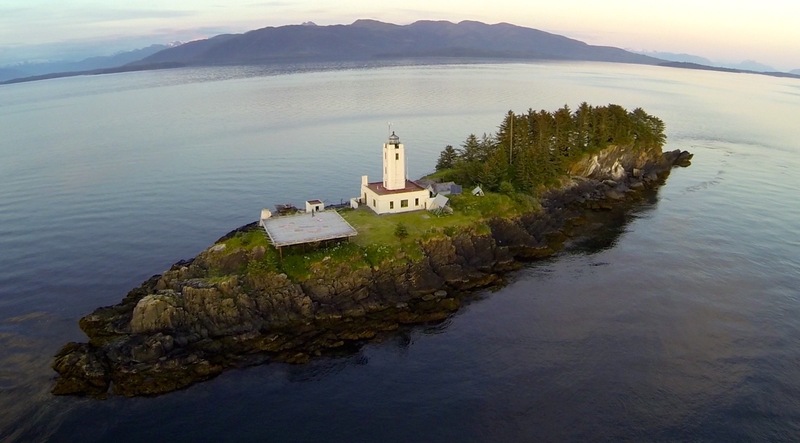 It’s a small, intimate island here at Five Finger Lighthouse, approximately three acres at low tide. Everybody knows everybody else. 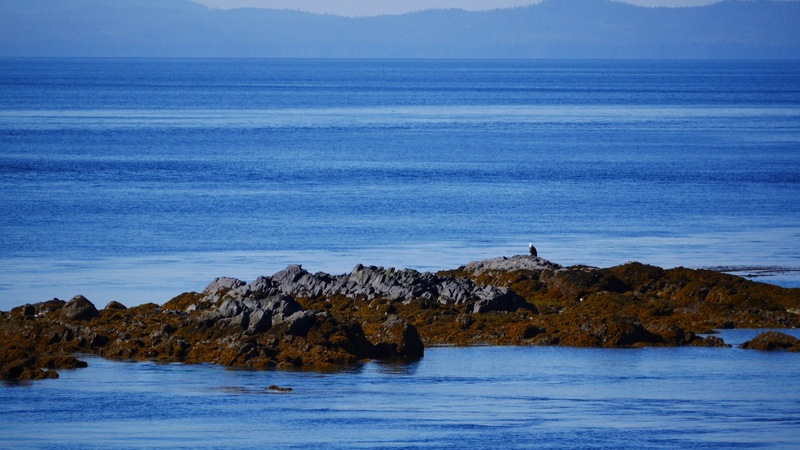 The crows, the eagles, the song sparrows, all the shore birds, a few harbor seals, and the three humans currently stationed here, we all live together in this tiny, SE Alaska island ecosystem. From intertidal zones to forest canopy there are many forms of flora and fauna coexisting, each in their own niche. It’s the crows however that seem most evident when taking a walk through the forest. As far as I can tell, it’s one extended family of crows on the island. With this years nest and a clutch of four eggs, that will bring the total to around ten birds if they all hatch successfully. The nest is located on a ledge, on the face of a rock wall, hidden behind a curtain of thimbleberry and salmonberry. Even though there are no natural predators for them here on the island, the crows keep a sharp lookout in all directions, taking turns guarding the nest and feeding on the feast that is presented to them at every low tide. By the time I get outside, the crows have moved out of the ravine by the lighthouse and into the small spruce forest, still sounding agitated. As I begin to walk underneath them I see they are harassing another crow, a fairly large one. An interloper. When the strange crow sees me he lifts off and heads off the island, all six or seven of the local crows in hot pursuit. I have seen this sort of gang behavior with crows before, usually though they are chasing some sort of raptor such as ospreys or eagles. But there is an eagle family with an active nest here on the island in very close proximity to where the crows are nesting and there seems to be no acrimony on either side. 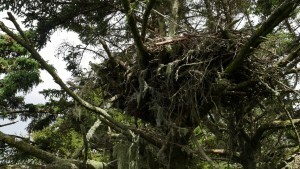 The eagles nest is huge, approximately six feet across and four feet high. It sits some thirty feet off the ground and is impressive to behold. 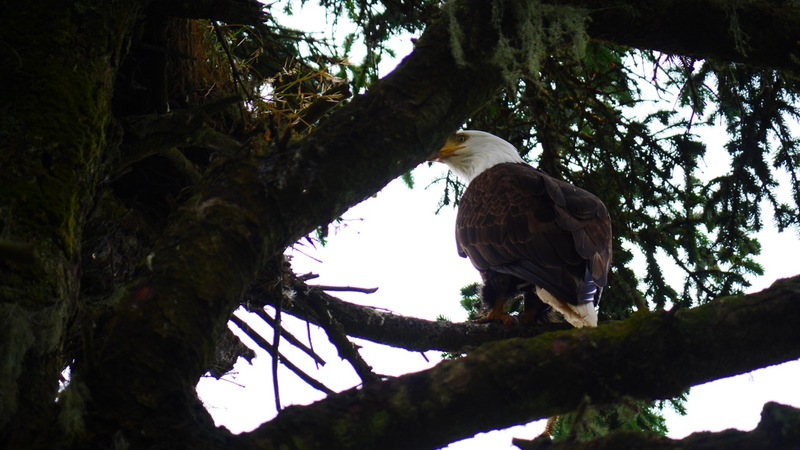 I asked the resident biologist here at the lighthouse, my brother, Dr. Fred Sharpe, about going up and taking a look at what may be in the nest. He said it would be good to know what’s going on there as the nest sits directly in the path of the sweep of the light from the lighthouse and there has been talk of cutting down the trees on the island to allow the light to be seen from the south, the direction it was originally intended to be seen from. 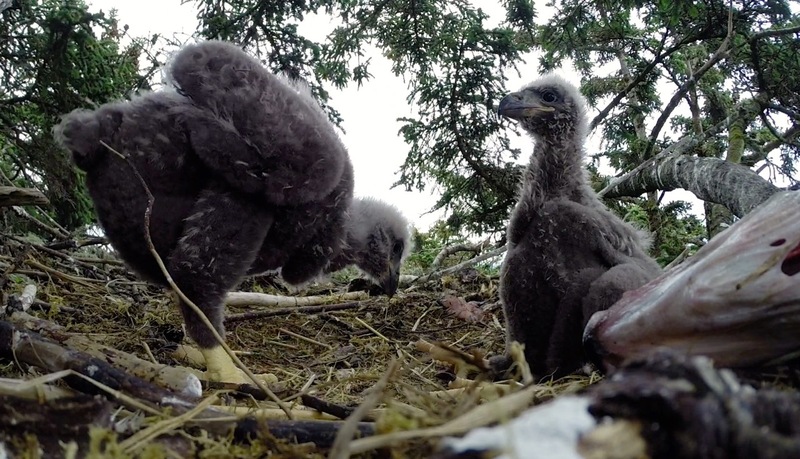 I am delighted to find two healthy eaglets in the nest. As the crow family returns from chasing away the intruder, I wonder how it is that they can get along so well with the eagles. It seems to go beyond an uneasy truce, it appears to me the crows and eagles here on our little island have an alliance, if not a friendship. 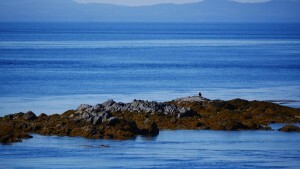 I have seen the crows and the eagles hanging out together on a small rock island that is mostly a reef at high tide, immediately adjacent to the lighthouse island. The first time I ventured into the tree closest to the one holding the eagle’s nest, the adults were not nearby. The crows saw me and scolded me loudly. The second time, a week later when I went up for a look, the adult eagles were again sitting on the adjacent island. This time however, two crows flew directly over to them, cawing loudly and both eagles lifted off to come over and and have a look, followed by the two crows that sounded the alarm. I am amazed by the degree of cooperation between them. The eagles here are habituated to human presence. 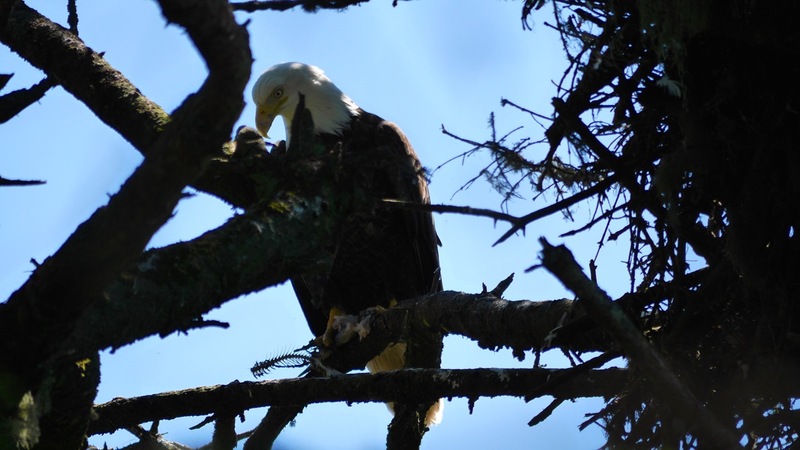 Generally now when I climb up to check on the progress of the two baby eagles in the nest, one of the adults will circle a few times, scolding me a bit then roost quietly in a tree nearby until I leave. I don’t spend much time near the nest, just long enough to click off a few pictures or drop a go pro into the nest that I leave behind for some intimate shots without me around. I feel fortunate to live so closely with such interesting and iconic creatures as crows and eagles. Good blog Paul! What good memories you will have. M and A safe at home. Will look forward to checking in on your special island. JJ and L.
It is fascinating to read about how birds get along. I wonder if the eagles assist the crows from time to time, also. Your writing makes me smile, Paul. What a wonderful story, and keen observation. Yes, crows live in extended families, and are very protective of their family members and territories. 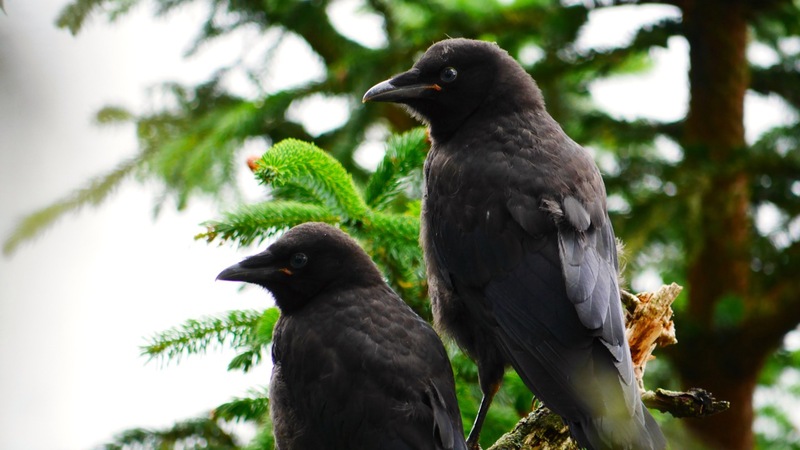 The fact that the eagles and crows are cooperative is of great interest to me, as I adore crows and eagles both (and most other wild animals…not ants who are insects). What a marvelous opportunity to watch the wonders of the natural world unhampered by man’s interference and unconscious presence. Thanks much for your sensitivity, keen observations, and story telling.